This Agee point was found several years ago in a cache with several other examples on the Crenshaw site in Miller County, Arkansas. The man who found it, Mr. Rayburn, is also the owner of the site. 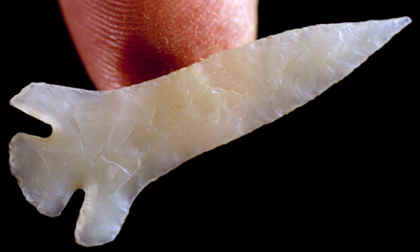 This Agee point was made from white Arkansas novaculite and it’s an excellent example of this fairly rare point type. Agee points were named by W.R. Wood in 1963 for examples recovered in burial mounds on the Crenshaw site in Miller County, Arkansas. These arrow points date to sometime between A.D. 700 to A.D. 1000. They are found on Late Coles Creek culture sites in Arkansas, Louisiana, Oklahoma and Texas. One very well made Agee point was found in one of the caches in mound 72 on the Cahokia Mounds site in southern Illinois.